Optional sightseeing tours: Gold Dredge #4: This huge dredge is 13 Km (8 Miles) south of Dawson City on Bonanza Creek Road (off the Klondike Hwy.) These dredges floated in their own ponds, scooping up creek gravel and gold. This is the largest wooden-hulled dredge ever built. Claim # 6 This gold claim is No. 6 above Discovery on historic Eldorado Creek. It was first staked by F. Ladouceur in October, 1896, not long after George Carmack made his famous discovery about a half-mile downstream. It has been owned by a variety of miners and mining companies, including the Yukon Gold Company. The Klondike Visitors Association owns the claim, and visitors are welcome to pan for free and can keep the gold that they find. Panning is restricted to hand tools only. Transfer to the airport. Departure from Dawson City around 4:40 pm. You'll arrive in Fairbanks at 4:55 pm. (Yukon Time - 1 Hour) Individual program extensions are available. It all began with Robert Henderson, a fur trapper and part-time prospector who, in 1894, found gold in Rabbit Creek (later renamed Bonanza) not far from where the Klondike River empties into the Yukon. When he had prospected this clear, shallow stream, he was certain he was close to a major find. Two years passed, however, before he could persuade his friend, George Washington Carmack, to go into the area. Carmack and his native companions, Dawson Charley and Skookum Jim, explored the area around the river the Indians called "Tr'ondek"—or Klondike to English tongues. The three lucky prospectors discovered gold on Bonanza Creek on August 17, 1896. A short time later, at the nearby mining camp of Fortymile, Carmack registered the discovery claim. Within days, Bonanza and Eldorado creeks had been staked from end to end. Carmack forgot to tell poor Henderson, who missed out entirely on the richest claims. Thirty thousand (some say fifty) pick-and-shovel miners, prospectors, storekeepers, saloon keepers, bankers, gamblers, prostitutes and con men from every corner of the continent poured through snow-choked mountain passes and down the Yukon River to stake their claim to fortune on creeks with names like Eldorado, Bonanza, Last Chance and Too Much Gold. Most seekers found no gold at all. But the prospect of sudden riches was not all that mattered. For many of those who made the incredible journey, the Klondike represented escape from the humdrum, the adventure of a new frontier. The town grew up in the shadow of a scar-faced mountain called Midnight Dome. Here on the flats of two riverbanks was a city of trampled mud streets, saloons, churches, gambling houses and theatrical shows. Wharves and warehouses lined the river's shore. White Pass & Yukon steamers could usually be found berthed at riverside docks, part of a fleet of 250 paddlewheelers, which plied the Yukon River. In early-day Dawson, gold dust could buy almost anything. One grizzled old prospector is reputed to have bought a dance-hall queen for her weight in gold. Traders, who packed tons of freight over difficult trails, priced their merchandise at whatever they felt the traffic would bear. Condensed milk sold for $3 a can; eggs, $18 a dozen, sugar, $100 a sack; butter, $10 for a two-pound can. A bowl of soup in a restaurant cost a dollar and a pint of French champagne sold for $30. A Seattle paper sold for $10, and its buyer rented it out for $2.50 a reading. By 1904, an estimated $100 million in gold had been shipped from the Klondike. No one really knows how much gold was found, however, because lots of it was never registered. At its height, Dawson City had a population of 35,000, but the "stampede" of `98 died out almost as quickly as it began. Stories of a new gold discovery at a place called Nome began filtering into the Klondike. As thousands of prospectors and miners rushed westward, Dawson as many towns before her became a ghost town. Unlike many gold camps, Dawson was never swept aside or buried in the onrush of civilization. When its dream was over, the town stood still. Many of the old landmarks disappeared one by one in disasters by fire or the callousness of man. But what remains provides a unique travel experience for those with a sense of history and adventure. "A symphony in honky-tonk that played itself out in four frenzied years." That's the way one famous early-day writer chose to describe the gold rush city of Dawson. Some of the old landmarks, like the Palace Grand theatre, have been reconstructed. Others, such as the Old Post Office, have been restored, since many sites in Dawson City have been designated of National Historic significance by the Canadian government. Restoration and maintenance of numerous gold rush buildings and at least one mining complex is being carried out by Parks Canada. Some of the town's firms like the Canadian Imperial Bank of Commerce, have opened their doors every business day for almost a century. In the bank, gold still is weighed and handled here, but not in the same quantities as it was when Dawson revelled in her prime. The Dawson City General Store on 540 Front Street (across from the Sternwheeler) Phone/Fax 867-993-5813 stocks fresh produce, in-store bakery, a full line of groceries, in-store deli. Open 8:00 am - 9:00 pm. Gold Claim 3rd Ave. Phone: 867-993-6387. 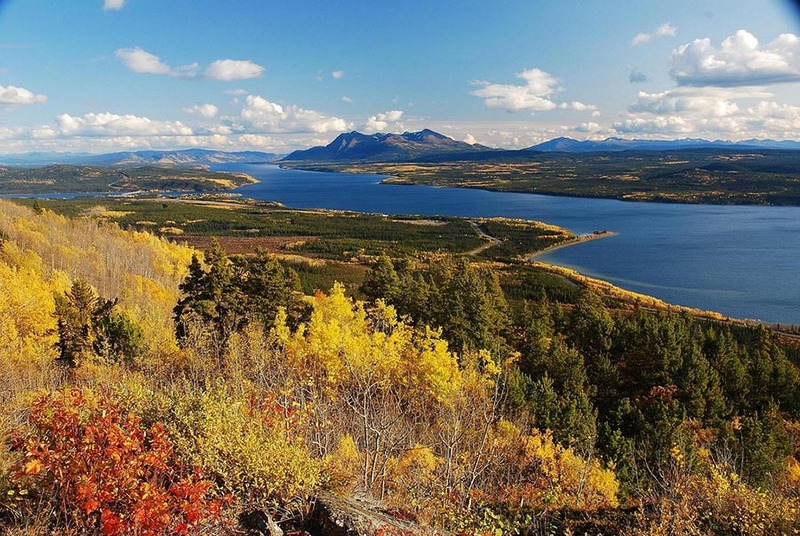 Provides the largest display of gold nuggets in the Yukon. Klondike Nugget & Ivory Shop on Front Street features a unique display of gold nuggets from the Klondike Creek and a 9 ft Mammoth tusk. This business has operated for over 90 years and produces exquisite jewellery using genuine gold nuggets from the area. A center for information on the Klondike Gold Rush, The North, Wildlife, Books, Gifts, and souvenirs. They also have great selection of postcards. Peabody's Photo 2nd Ave. At Princess Ave.
Old fashioned portraits, photo supplies & gifts, photo finishing and film. 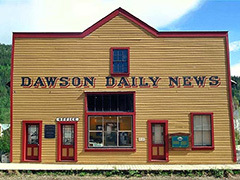 Most Dawson City attractions are open from mid- May to mid-September. Advance reservation for Tours, Hotels, B&B, and other accommodations are highly recommended. Diamond Tooth Gertie's Gambling Hall. Events feature a parade, numerous exhibits, plus raft, canoe and bathtub races, dances and other activities during the third weekend of August. Advance reservations for accommodation are recommended. A highly recommended variety show that relives the Gold Rush era, playing every night at the Palace Grand Theatre. Check for show times. Admission fee. Stamps may be purchased, so letters may be postmarked and mailed at Dawson's original post office constructed in 1901. The old building is a National Historic Site restored and maintained by Parks Canada. Daily at 10am and 3pm ballads of the Yukon poet Robert Service are recited. Tours and readings are conducted daily. At Fifth Ave. and Church St. in the old Administration Building, is open daily from 10am to 6pm and features an interesting display of early-day relics. Special features include Dempster slide show, silent movies and historical films. Minto Park, located next to the museum, has a collection of old locomotives, including an old diamond stacker used in early mining operations in the Klondike district. Is the biggest wooden hull, bucket-line gold dredge in North America It rests on Claim No. 17 on Bonanza Creek, 10 miles from Downtown Dawson City on Bonanza Creek Road. Maintained by Parks Canada, the giant dredge offers visitors tours daily. Originally built in 1898 by impresario and gold seeker, Arizona Charlie Meadows. It has been fully restored and is a National Historic Site. It can be found at King Street and Third Avenue.Tours are conducted daily. Front and York Street, 867-993-6564. Featuring tours, Theatre and Gift Shop. Are scheduled during the summer months, from the Visitor Reception Centre. Walking tours of the Government Reserve including the N.W.M. Police buildings, old churches in the area and Commissioner's residence. Leaves twice daily from the Commissioner's Residence. A: How about Gold Panning? Gold panning is prohibited at claims other than those commercial ventures who are having been opened to visitors and claim #6 above Discovery, which is owned by the Klondike Visitors Association and is preserved for public use free of charge. Here you can try your hand at panning for gold. What you find, you keep. Bring your own gold pan. 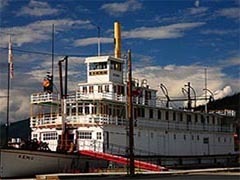 A: How about the Yukon River Ferry? George Black Ferry. Ferry operated by the Yukon Government. It runs 24 hours daily in the peak summer periods (except for it's weekly maintenance on Wednesdays from 5:00 - 7:00 am) across the Yukon River. Depending on the ice, the ferry commences it's operating season from the third week in May to mid-October. It departs on demand to carry vehicles and passengers across to the public campground and is the only connection to the Top of the World Highway. Peak traffic periods are from 7:00 - 11:00 am and 4:00 - 7:00 pm during busy summer periods. All propane appliances must be shut off for the trip and follow directions from ferry personnel when loading and unloading. Tour bus traffic has priority 6:00 - 9:00 am and 5:00 - 9:00 pm fuel traffic has priority from 7:00 pm to 6:00 am. Phone 867-893-5441 or 993-5344 for more information. A: How about the First Nations? The Tr’ondëk Hwëch’in is a Yukon First Nation based in Dawson City. The citizenship of roughly 1,100 includes descendants of the Hän-speaking people, who have lived along the Yukon River for millennia, and a diverse mix of families descended from Gwich’in, Northern Tutchone and other language groups. from ground level, you can frequently see it while on a hike that gains elevation, or on a flight seeing trip. A: How about the Cultural Scene? Find many casino favourites at Diamond Tooth Gertie's, named for the dance-hall queen Gertie Lovejoy and her signature diamond-studded smile. Games include blackjack, roulette, poker, slot machines and more. For some fun, catch a live can-can girls performance, with three nightly shows. Food and beverage services are also offered. Open from May to September. A: How about Parks Canada? The Klondike National Historic Sites of Canada commemorate the 1896 Klondike Gold Rush, the role of large corporation gold mining in the Klondike and river transportation in the Yukon. 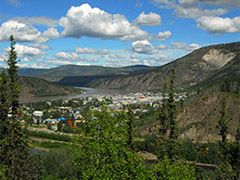 Dawson City, conveniently located at the junction of the Yukon and Klondike Rivers, quickly became the heart of the gold fields during this time. For a glimpse of the glorious past of the gold rush era, visit the Klondike National Historic Sites of Canada such as Chilkoot Trail Historic Site, S.S. Klondike National Historic Site, Klondike Goldrush National Historic Park. A: How about the Music Festival? The festival takes place at five separate venues in downtown Dawson City. All of our venues are in easy walking distance of one another - and of Dawson’s many hotels, B&Bs, campgrounds, RV Parks, restaurants, shops, tourist attractions and other amenities.Mainstage concerts are scheduled for Friday, Saturday, and Sunday evenings. Concerts at the Palace Grand Theatre occur on Saturday and Sunday evenings, as well. This year’s festival includes a special Saturday evening concert in St. Paul’s Anglican Church, concurrent with mainstage and Palace Grand activities. Having trouble deciding which concert to attend? Don’t worry, the mainstage will be going strong well past midnight, so there’s often lots more music to catch after the off-site shows. The mainstage is also home to Saturday’s KidsFest. For the rest of us, daytime concerts and workshops take place in venues throughout town all-day Saturday and Sunday. There will also be a free Kick-Off Concert at the Gazebo on Front Street on Friday afternoon. This event is presented by CBC North.